Downloaded more than 100.000 times from 193 countries. InvoicePlane is a solid application to manage your complete billing circle: from quotes over invoices to payments. The application provides CRM-like management for your clients. Enter contact details, notes or add custom fields. Basic project and task management is also available. You can customize InvoicePlane to make sure it fits your needs: select from different themes, set amount formats, modify email and PDF templates or many more. 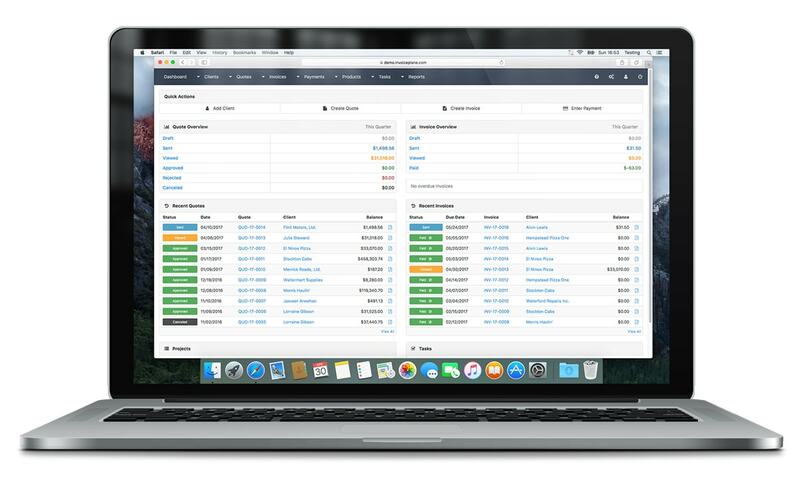 Let your clients pay the invoices by using one of 25 different online payment providers like PayPal, Stripe or even using Bitcoin via Coinbase. InvoicePlane is translated into many languages by community members and more languages are coming soon. We are a little italian company. Personally think that invoiceplane is the best open source invoicing project. It help us daily to best manage our business, free! Thanks to the Invoice plane team to come up with a application, which satisfies the invoicing related prerequisite . Simple to utilize. I am as of now recommitting this application to my companions. InvoicePlane is exactly what I've been looking for! I was very happy to have more control over my invoicing and to stop paying Freshbooks.